DEVONIAN FAUNA OF THE SOUTH OF ENGLAND BY WHIDBORNE. 1892 - 1907. 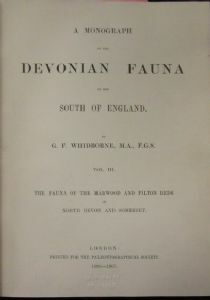 The Devonian fauna of the South of England by G.F.Whidborne. Palaeontographical Society Monograph. 1889 -1892. Complete in 3 Volumes. A rare and much sought after publication. Covers Trilobites, Brachiopods, Bivalves, Cephalopods, Gastropods. Bryozoans, Crinoids and Starfish amongst others. 823 pages in total and 92 plates of fossils. Cloth bound. In excellent condition. Ex Keele University Library. For any serious student or anybody with an interest in Devonian fossils this is a must have publication. each volume 28 x 21 cm. Total thickness of all three volumes : 11.5 cm.